Dunes flow over one another in waves as caravans of people and camels navigate the treacherous terrain of the Sahara. The oscillating lines that the figures stand on are reminiscent of a winding river or the ocean surf. While this composition is relatively simple, its whimsical elements, such as the faces of the camels and the scale of the figures, expertly engage the viewer. Influenced by the inclinations of the Art Deco movement, which was popular during this time, geometric patterns are employed to create movement within the composition. Other influences from Art Deco are the use of primary colors, blocks of color, and streamlined contours. 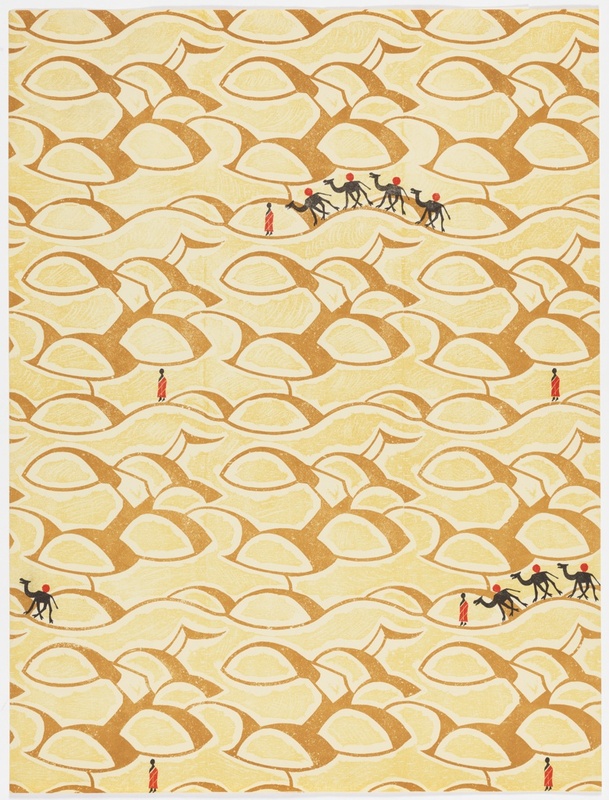 Sahara wallpaper was originally printed in 1928 by The Curwen Press and was designed by Edward Bawden. Originally created as a linoleum block print, Bawden’s preferred medium, The Curwen Press excelled at lithography and used this technique to capture all the nuances of Bawden’s original. While the lithograph did pick up all the textural qualities of the linoleum print it could only produce wallpaper printed on individual sheets, not the more standard roll. Edward Bawden was an English designer who created artwork in a variety of media but was best known for his painting, illustrations, and graphic art. Over the course his life, Bawden held many important positions which included being an official war artist during World War Two and teaching design at the Royal College of Art. Emily Ewen is a student in the History of Design & Curatorial Studies graduate program at the Cooper Hewitt, and is a Master’s Fellow in the Wallcoverings Department.